PLANO, Texas--(BUSINESS WIRE)--Mar. 23, 2018-- Cinemark Holdings, Inc. (NYSE: CNK), a leader in the motion picture exhibition industry, announced today that it will remodel its Cinemark Lufkin 12 theatre. The renovation and upgrade will include adding Luxury Lounger reclining seats to all auditoriums. 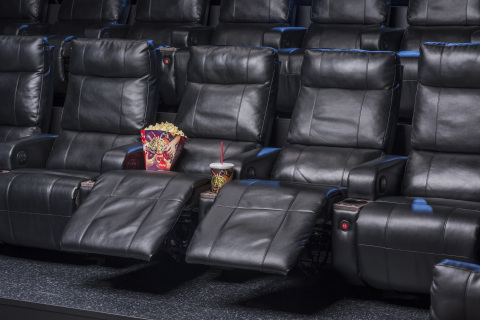 Cinemark Luxury Loungers are electric-powered, plush, oversize lounge chairs with footrests and cup holders. The seating conversion and enhancements to the theatre, conveniently located at 109 Miles Way in Lufkin, Texas, will begin this summer. Download the Cinemark app to view show times and purchase tickets on the go. Join Cinemark Movie Club which is a unique monthly movie membership program offering exclusive benefits including one 2D ticket per month, concession discounts, waived online ticketing fees and more for just $8.99 per month. Movie-lovers can instantly join and begin taking advantage of their benefits by downloading the Cinemark app or by visiting cinemark.com/movieclub. Join Connections, Cinemark's Loyalty Program, rewarding loyal guests with discounted concessions, digital downloads, movie upgrades, physical movie swag and more. Customers can sign up by visiting cinemark.com/connections or by downloading the Cinemark app available on iOS and Android devices. Stay connected through Cinemark's social media channels at Facebook, Twitter and Instagram (@Cinemark or #Cinemark). Cinemark is a leading domestic and international motion picture exhibitor, operating 533 theatres with 5,959 screens in 41 U.S. states, Brazil, Argentina and 13 other Latin American countries as of December 31, 2017. For more information go to investors.cinemark.com.